Founded by John Farrington and George W. Hunnewell. Partnered with brother Henry Farnham 1800-1807.
the partnership of Farnham & Ward c. 1815 with Richard Ward. A partnership between Henry Farnham and Richard Ward. George Wilson Fairchild / G.W. 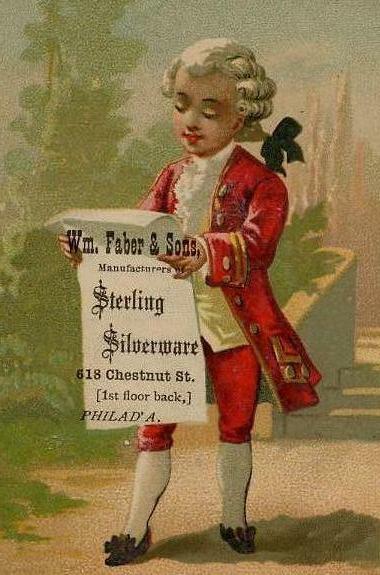 Fairchild & Co.
Silversmith and jeweler. Was in business as G.W. Fairchild & Co.
continued in business until the 1960s. James Knowlton Fellows / J.K. Fellows & Co.
Ignatius W. Fellows 1833-1837; J.K. Fellows & Co.
Lewis S. Fellows and John A. Storm. In the partnership of Fales & Gooding with Josiah Gooding c. 1820. Taylor with an unknown partner in the 1840s. for flatware which were then made by Alvin. A partner in the firm of Adams & Farnsworth 1846-1851. John C. Farr / J.C. Farr & Co. Worked as J.C. Farr & Co. 1837-1853.
of J.E. Caldwell & Co. 1848-1856. Abraham Fellows, William T.B. Read, and J. Olcott. Arthur & Federhen with H.G. Arthur in 1831. J. & J. Federhen with his brother Jacob Federhen 1834-1841. Wm. 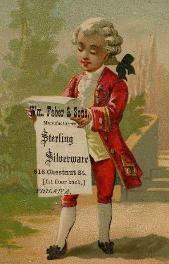 Perry, Jr. & Co. 1849-1851. John Federhen & Sons with sons John Federhen III and Herbert M. Federhen 1872-1881.